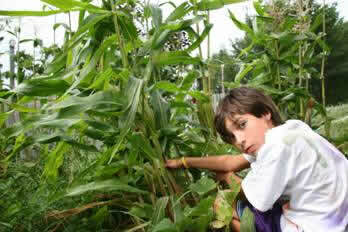 Gardening is a natural activity for most kids since they like to dig, get dirty and look for worms. Kids also love to see the results of their work and will eat it, too. Plants squash, peppers, watermelons, beans and fruits and your kids want to take part in cultivating them and will take pride in their accomplishments. Below are shots of my neighbors, Jackie and Jillian Markaway, who planted watermelon, squash and bushbeans in a small raised bed I made for them (April 19, 2010). First they smooth the soil (a combination of compost, potting mix, topsoil). Note the kids' garden tools and gloves you can purchase at most garden stores. I got the hoe and shovel at Dollar General. Then they make rows for the seeds. Jillian plants bush bean seeds. Jillian covers the seeds while Jackie looks for worms. All done. Now they wait for a few weeks to see what sprouts. 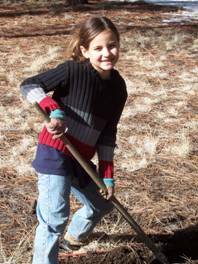 Here Ari and Tosh digs through the cinders and pine needles in Flagstaff, AZ, 2004. Even with a broken Arm, Ari helped to take care of the containers of plants off our porch in Flagstaff. She and Tosh snipped okra and green beans late summer and fall. Ari was very excited about her gourd vines. 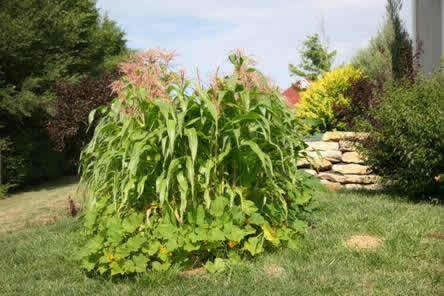 They grow quickly and can overtake your other fences, so plant carefully. Kids can make bird houses from the gourds. Ari and plant experiment in 2004. Ari’s Baldwin City, Kansas garden in 2006 was comprised of many plants, including tomatoes, squash, cucumbers, loofah gourds, and a variety of flowers along the fence. 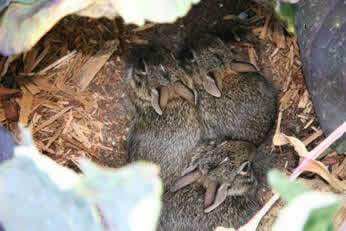 One day I went out to water the cabbage and found 6 baby bunnies under the leaves. 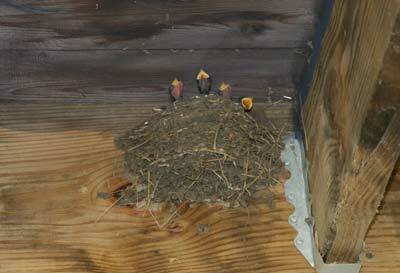 I ran back inside to get my camera and when I returned there were only 3. These little guys had survived twice-a day waterings. 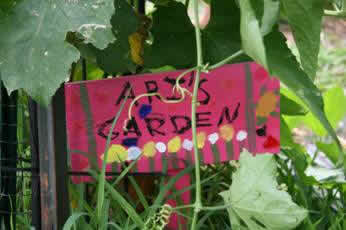 My son Tosh announced in spring of 2006 that he wanted to plant a Three Sisters garden. Everything was planted from seed and kernel. 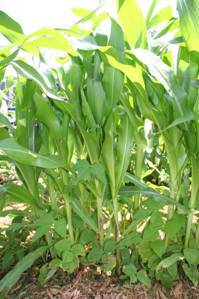 He tended it everyday and was very happy to cultivate corn, squash and pole beans. 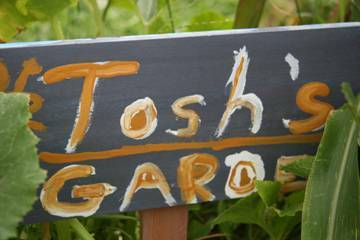 Tosh’s corn, squash and beans. Rt. : Tosh and Ari find squash in the 04 Flagstaff garden.